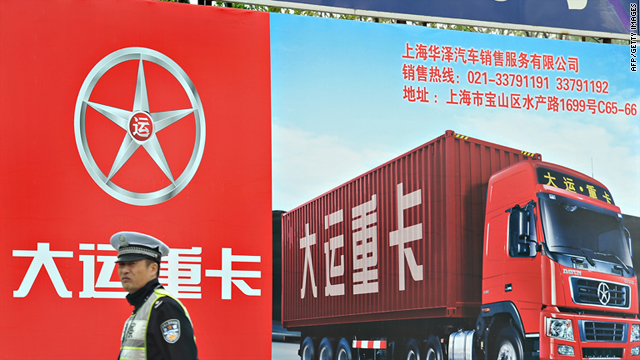 A Chinese policeman stands in front of a billboard of a truck at a port area of Shanghai amid strikes by drivers last week. Beijing, China (CNN) -- When hundreds of truckers went on a slowdown strike in Shanghai several days ago, the impact was immediately palpable: The movement of goods in one of China's largest container ports was virtually paralyzed. China watchers wondered how authorities would react. Will they send in the anti-riot troops? How soon will the heavy hand of the state come down? The crackdown did not happen. Instead, the Shanghai authorities agreed to reduce the fees imposed on the truckers, thus placating the strikers who complained that the fees were onerous, given the high inflation and fuel prices. The authorities blinked. The Shanghai strike, experts say, is not an exceptional case. In recent years, local officials in Beijing, Shanghai and Guangzhou have given in to public pressure -- street demonstrations, silent "strolls" and online campaigns -- on controversial issues. In some cases, government planners had to abandon plans to build chemical plants and waste incinerators when residents expressed concerns over environmental and health hazards. The gentle handling of these potentially explosive mass actions contrasts starkly to the harsh crackdown on political dissent. Over the past several weeks, Chinese police have rounded up scores of political activists, lawyers and bloggers, including Ai Weiwei, a prominent artist and political activist. "Stability trumps everything," a Communist Party official told me. (He declined to be identified because he is not authorized to speak on the matter.) "We cannot be wishy-washy and just leave matters to chance." So what is behind the kid's-glove approach to such mass actions like the Shanghai truckers' strike? "They are challenges to specific issues rather than ideologically driven, cross-regional organized events," said David Zweig, political science professor at the University of Science and Technology in Hong Kong. "They are citizens' protests, not political actions aimed at changing the regime or forcing political reform on the regime." Political activists like Ai Weiwei, experts say, are viewed differently. "These activists have challenged (the regime) for a long time and would not compromise," says Li Fan, a political scientist. "That's why they are treated severely. They are like scapegoats, as we say -- 'kill the chicken to scare the monkey,' because the government will not allow the emergence of leaders of the opposition." That China should experience a spike in popular protests is hardly surprising. It is going through wrenching socioeconomic changes. Problems loom, among them unemployment, high inflation, corruption, onerous taxes, the rising cost of education, health and housing. "There has been dissatisfaction over rising prices but no action until now," Li said. "Officials feared what happened in Shanghai might lead to a nationwide movement. That's why it was handled swiftly." China's officialdom is coming to grips with the increasing uneasiness of millions of citizens who are no longer content to meekly follow everything it decrees. In Nanjing, for example, citizens last March tied green ribbons around wutong trees along a major road after they learned that city leaders were planning to uproot them. The trees, some of which have lined the streets since the 1930s, were to be removed to make way for a subway construction project. Residents protested. "The Wutong trees are not your private property," wrote one microblogger on Sina.com. "We citizens have the right to know what's happening to them ... And if you asked us, the answer is 'no.' Why don't you understand that history is vital to a city and that trees have feelings?" Netizens initiated an online campaign involving tens of thousands of microblog users. Days later, the city government suspended the plan to move the trees. Despite the official censorship on China's cyberspace, observers credit the New Media for playing a unique role in galvanizing public opinion. The Chinese call this "weiguan" (surrounding attention, or kibitzing)--the use of the Internet and social networking sites by Chinese netizens to influence agendas by tweeting and retweeting opinion and focusing attention on issues and news events. Many times, "weiguan" has changed government policies and behavior. "The traditional one-way flow of information -- from official media to the audience -- is being altered by the multi-way flow of information online because of social media," says Bu Zhong, assistant professor at Penn State University. "The compromises that we've seen lately show how officials are learning to handle crises in the age of social media -- suppression does not always work anymore. What's happening today was not conceivable in China 10 or 20 years ago." Still, experts say, recent outbreaks of social unrest highlight the scarcity of legal avenues for people in China to participate in state affairs. "The need for social participation is growing but there is no channel or system for the society to participate," says Li Fan. "The result is political instability."